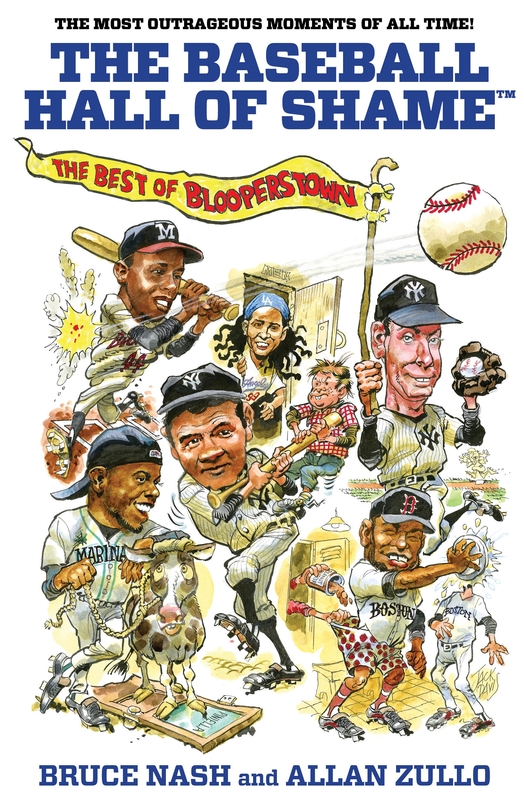 After some 20 years, Bruce Nash and Allan Zullo have returned with the 5th volume of Baseball Hall of Shame, this one called The Best of Blooperstown, but again with original cover art by the great Jack (Mad Magazine) Davis. These books (and their spinoffs) have sold more than 750,000 copies, making them one of the great publishing success stories in baseball history. And yes, they are the same books that you read under the covers, afraid that Bowie Kuhn would catch you. Bet you didn’t know there was a good message behind it all – it’s okay to make a mistake, even these Major Leaguers did! The baseball season is only a month old and already some wild and crazy things have taken place: Atlanta Braves outfielder Michael Bourn delaying a game for a potty break… the San Diego Padres bunting into a triple play… Kansas City Royals relief pitcher Jonathan Broxton plunking two batters in a row to blow a game. Here are the authors “Top 10 Things You WON’T See During the New Baseball Season”– guaranteed! 1. A batter knocking himself unconscious with his own foul ball! 2. A rookie striking out– while sitting on the bench! 3. A player trying to hit with a table leg instead of a bat! 4. A batter running toward third instead of first after hitting a ground ball! 5. A ballplayer out-eating an ostrich in a spaghetti-eating contest! 6. A batter whacking a triple– but being called out for missing both first AND second base! 7. A pitcher firing a beanball at the on-deck hitter! 8. An angry batter being ejected from a game for biting the home plate umpire’s arm! 9. An outfielder given the heave-ho from a game for falling asleep at his position! 10. An outfielder trapped in a doghouse while chasing after a ball as the batter circles the bases for an “Inside-the-Doghouse Home Run”! No, you won’t see these nutty moments during the 2012 baseball season. They’re too ridiculous, too absurd, too unbelievable to be true, right? Wrong! These events actually happened during a Major League game– and they’re all chronicled in Nash & Zullo’s new book! (#1– Billy Herman, August 29, 1931; #2– Doe Boyland, September 4, 1978; #3– Norm Cash, July 15, 1973; #4– Jimmy St. Vrain, April 27, 1902; #5– Ping Bodie, April 3, 1919; #6– Marvelous Marv Throneberry, June 17, 1962; #7– Burleigh Grimes, June 18, 1934; #8– Bob “Fats” Fothergill, May 24, 1926; #9– Edd Roush, June 8, 1920; #10– Ed Delahanty, June 1, 1891). Nash and Zullo have also created Bingo Batting Averages (below .100) to compliment the now-classic Mendoza Line (below .200). A bingo average is one pronounced like a bingo call-out – “Oh-seventy-seven” for example. This past week, nine players were still playing with bingo averages! I remember in grade four having a special section on the inside of my locker. I called it “The Hall of Shame”. To make my HOS, a player needed to have a baseball card with a funny picture. Either a funny face, pose, uniform or all of the above. Billy Ripken 1989 Fleer? Pascual Perez? Any of his cards made it with that wind-up of his. So the idea of a Hall of Shame has always been true and dear to me. Then when I uncovered the HOS book by Nash and Zullo, I knew that I had found a winner. An entire book devoted to baseball stories, pranks, bloopers and miscues. Truly a baseball fan’s dream. Just taking a look through the Table of Contents, I knew exactly what kind of read I was in for. My kind of baseball reading! Some of the chapters include: “Pranks a Lot! The Wildest Practical Jokes; Every Trick in the Book- The Sneakiest Cheating; and Booing the Boo Birds- The Most Obnoxious Fan Behavior.” You get the idea. If something strange, interesting or wild happened on a baseball field- it is likely in this book. I can’t tell you how many times I laughed out leading reading The Baseball Hall of Shame. Steve Lyons dropping his pants? Page 108. George Brett pine-tar incident? Page 246. Randall Simon attacking the mascot? Page 27. The list literally goes on and on. This is not your deep thinking statistical baseball read. This is your fun, light walk down baseball memory lane. Aside from remembering so many of the stories mentioned in the book, I also got to learn a whole new set of bloopers from years gone by that were before my time. Bob Moose throwing a pine-tar ball? It’s there on page 120, followed by Pete Rose’s plot to use Japanese baseballs right after. Guns firing off at the ballpark in celebration? It happened…in Chicago (where else), July 4, 1900. Right there on page 181. The list goes on…and on. Each story stranger than the other. As I was going through the book, I found each anecdote more and more interesting and fun to read. A book that is almost impossible to put down. I wish I had this book on my last few baseball roadtrips. Sitting with the gang in the car or on a plane, this would have been a great book to crack open and share stories. Or after a long hard day, to read a few chapters and laugh out loud. If nothing else, during baseball conversations at the ballpark (inevitable during 3+ hour long games), sharing the information one has learned in this book to look like quite the baseball connoisseur would always be a bonus. I will guarantee you this much. When you finish reading the Baseball Hall of Shame, you will be better off for it. You will learn about the crazier side of baseball. You will learn about the countless stories and facts that have made the game so unique and different. You will never be out of the loop on a baseball history conversation and actually, you will impress even the biggest die-hards. I can’t say enough good things about the Baseball Hall of Shame: The Best of Blooperstown. It is a book that allows the game of baseball to laugh at itself and remind us that at the end of the day, it is only a game. Even with big salaries and big business all around us, baseball was meant to be light and fun. The Baseball Hall of Shame lets the game go back to just being a game. Nash and Zullo are strong storytellers. They keep their chapters and stories short and concise. They cut to the meat of each incident and keep the flow of the book at a steady level. The Baseball Hall of Shame is a must-own for every baseball fan. Get on the internet, jump into your car and head to your local bookstore. Whatever you have to do – do it! One of the best baseball purchases you will ever make. The Baseball Hall of Shame is a book that will last a lifetime and always be relevant in your baseball fandom. Sure, we love to celebrate the great achievements in baseball. But there is a time and place to remember the other side of the game. The Baseball Hall of Shame: fun. Funnier. Maybe the funniest baseball book you will ever read. BRUCE NASH, president of Nash Entertainment, is the creator and executive producer of more than 80 television series and specials, including “Before They Were Stars,” “Magic’s Biggest Secrets Finally Revealed,” “Meet My Folks,” “Who Wants To Be A Superhero?” and “Most Shocking.” His “Modern Marvels” series is one of cable’s longest running programs, with more than 500 one-hour episodes. On the sports front, Nash created and produced the critically acclaimed series “Amazing Sports Stories,” which was nominated for four Sports Emmys. His company is headquartered in Hollywood, California. 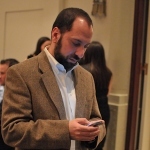 ALLAN ZULLO has written more than 100 nonfiction books on such subjects as sports, the supernatural, history, animals, war, survival, heroism and grandparenting. His latest books are Heroes of 9/11 and Titanic: Young Survivors. Among his many sports books are When Bad Things Happen to Good Golfers, Golf is a Funny Game and March to Madness. He writes two best-selling series for Scholastic, Haunted Kids and Ten True Tales. He lives near Asheville, North Carolina. Posted on May 6, 2012, in The Rest: Everything Baseball and tagged allan zullo, baseball, baseball hall of shame, best of blooperstown, book review, bruce nash, lyons press, mlb. Bookmark the permalink. Leave a comment.